Thinking of Filing a Personal Injury Lawsuit? 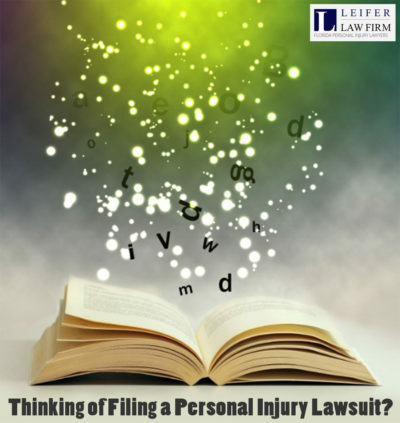 Filing a personal injury lawsuit is often like a “choose your own adventure” book. It can involve a number of steps in the legal process, a number of characters that pertain to your case, and numerous factors that all contribute to the ending, or your legal outcome. 1. Getting Your Story Straight. A personal injury attorney can listen to your side of the story and tell you if you have a viable case. Some personal injury cases are, well, stories and don’t have a solid foundation. But an experienced personal injury attorney will take the time to understand your situation and help you to reach the best possible happy ending. 2. Aligning Characters. A typical personal injury case can involve a number of characters—such as witnesses, third parties, and even organizations, depending on the type of case. A personal injury attorney will organize these characters and gather information from each in order to “plot” your case. 3. Climax to Settlement – A Happy Ending. Each case has its peak—or point of climax before the story ends. A personal injury case works much the same way. The point of reaching a settlement or going to trial is often the point of climax in a personal injury case. But a personal injury attorney will see it through to the end…and work with you to make sure that you receive a fair settlement for your accident—a true happy ending. A personal injury case has many avenues—from the type of case (such as a car accident, slip and fall accident, or even a premises liability accident) to the parties involved to evidence, each case is unique in its own way and has its own “story” to tell. Work with a personal injury attorney to help you tell your story. For more information on how a personal injury attorney can help you with your case, or to see if you have a viable case, contact the law team at Leifer Law. Call us today at 561-395-8055 to schedule your initial consultation today.